Photograph courtesy Tony Sayer. 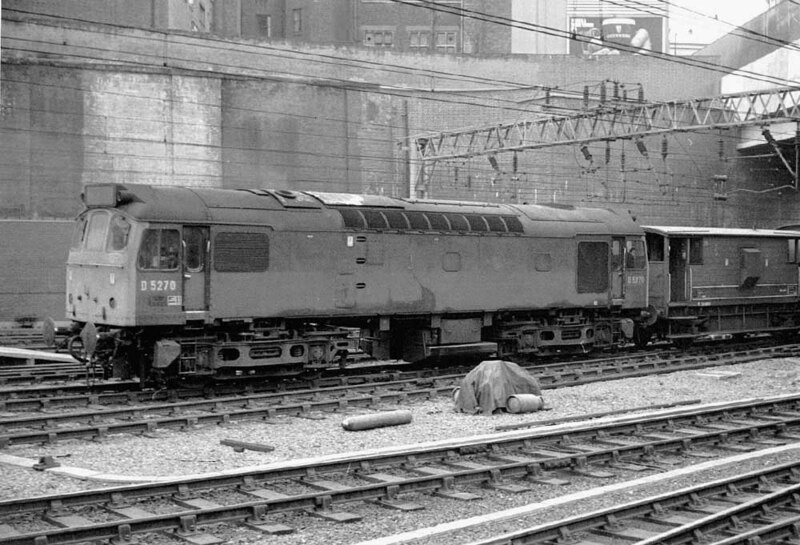 5270 at Birmingham New Street on May 27th 1969. The locomotive still sports the original circular exhaust port and an all too familiar coat of grime that regrettably covers one of the more pleasing liveries once found on BR. The nineteen year career of D5270/25120 was spent allocated to a multitude of London Midland Region depots. Time between withdrawal and scrapping: 6 months. May 1964 to Leicester (15B). September 1964 to Toton (16A), then to the Nottingham Division (D16). September 1967 to London Midland Midland Lines. April 1968 to Cricklewood Division (D14). February 1970 to London Division (D01). July 1970 to Nottingham Division (D16). June 1982 to Springs Branch. Withdrawn November 27th 1983 due to collision damage. 25120 was the 202nd Class 25 to be withdrawn, one of two retired during November 1983. After its withdrawal 25120 was stored at Springs Branch, then moved to Crewe on February 8th 1984, here 25152/167/168 were added and reached Swindon Works by February 16th 1984. By the end of May 1984 25120 had been broken up. Noted Derby Works June 1969. Noted Derby Works August & September 1970. Noted Derby Works November 1976 (Classified). Noted Derby Works October & November 1980 with collision damage. With a considerable length of time spent at LMR sheds that provided power for the summer dated passenger services 5270/25120 was able to accumulate a considerable passenger mileage. The earliest recorded passenger working occurred on September 2nd 1967 working the Nottingham - Llandudno Town & return with D7643. August 21st saw 5270 & 7605 work the Nottingham - Llandudno & return. On November 25th 5270 was busy on the Redditch branch assisting in the removal of the northbound line at the station. 5270 & ?? worked the Nottingham - Llandudno Town round trip on July 30th. The Walsall - Yarmouth (to Norwich) - Derby diagram was worked by 5270 & 5223 on August 5th. The next day (6th) the same pair worked a Derby - Skegness roundtrip (see image below). Photograph collection of Roger Geach. 5270 & 5223 at Derby on August 5th or 6th 1972. The Derby - Norwich - Yarmouth - Norwich - Walsall diagram was worked by 5270 & 5251 on June 2nd. 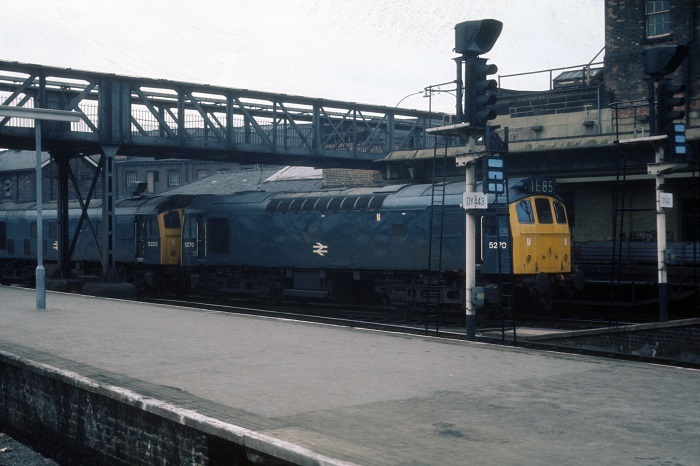 Two weeks later on June 16th 5270 and an unidentified Class 25 worked the Walsall - Yarmounth service, both failed en-route but 5270 was able to be restarted, arriving two hours late at Norwich. On July 28th a Derby - Skegness roundtrip was worked by 5270 & 5279. The Derby - Norwich - Yarmouth - Norwich - Walsall diagram was worked by 25120 & 25182 on September 14th. On September 21st a roundtrip Derby - Skegness was worked by 25120 & 25118. The Derby - Norwich - Yarmouth - Norwich - Walsall diagram was worked by 25120 & 31280 on June 14th. Two days later (16th) a roundtrip Leamington Spa - Aberystwyth day excursion was worked by 25120 & 25054. A visit to the Western Region took place on July 19th with 25120 & 25214 working the 12.40 Birmingham New Street - Paignton relief throughout. On September 11th 25120 was noted northbound at Northallerton with coal empties. On September 13th the 08.52 Leicester - Skegness and the return 12.30 Skegness - Leicester were worked by 25120 & 25076. The Walsall - Norwich (for Yarmouth) - Derby diagram was worked by 25120 & 25131 on July 24th. On August 15th 47329 failed at Banbury working the 12.39 Poole - Newcastle, 25120 took the service forward to Birmingham New Street. The end of August was quite busy for 25120 & 25131, on August 28th they worked the Walsall - Norwich (for Yarmouth) - Derby diagram, followed on August 29th & 30th by roundtrip Derby - Skegness workings. The Walsall - Norwich (to Yarmouth) - Walsall diagram was worked by 25120 & 25254 on June 4th. On June 5th a Stroud - Barmouth day excursion was worked forward from Wolverhampton by 25120 & 25254. For the return the locomotives worked the 17.30 Barmouth - Birmingham New Street to Shrewsbury. The longest one day working occurred on a rather damp June 12th working the Silver Jubilee Conway Valley Adventurer from Oakham to Blaenau Ffestiniog and return with 25036 (410 miles). The leading locomotive carried a large blue & white headboard. The Derby - Norwich (for Yarmouth) - Derby diagram was worked by 25120 & 25117 on September 3rd. During November 25120 moved to Cricklewood, its use on passenger workings dropped to virtually nil for the four and a half years spent here. On June 23rd the 10.10 Euston - Aberystwyth from Birmingham New Street and the return 16.10 Aberystwyth - Shrewsbury were worked by 25120 & 25032. The next day (24th) the same pair worked the 08.45 Birmingham New Street - Barmouth forward from Bescot, replacing 25161 & 25272. During September 25120 received an 'E' examination at Reddish. Photograph courtesy Danny Preston, collection Neil Johnson. 25120 at Stafford with a lengthy ballast train on April 5th 1981. On April 24th 25120 worked the 15.42 Manchester Victoria - Bangor and the 19.26 Bangor - Manchester Victoria as far as Llandudno Junction where it was replaced by 25086. On May 29th 25120 & 25185 worked the 07.40 Euston - Aberystwyth forward from Wolverhampton, returning with the 14.00 Aberystwyth - Shrewsbury. The morning Ellesmere Port - Drayton tanks were noted passing Didcot behind 25120 & 25060 on September 13th. 25060 & 25120 spent some time in the North East in early November, 8th found them in charge of the Haverton Hill – Stevenston tanks whilst the next day they crossed the Pennines towards Carlisle with a Parkeston – Mossend working. Photograph courtesy Ian Marsh. 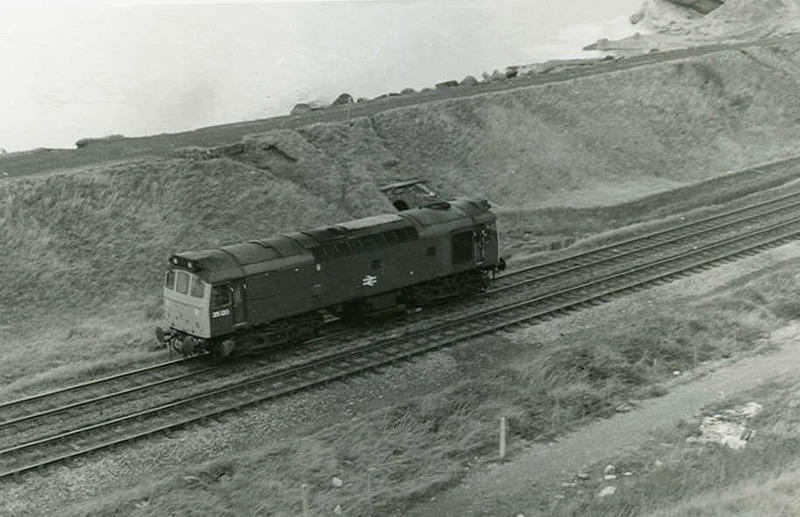 An interesting view of 25120 at Moss Bay, Workington, date unknown. The trailing axle on the No.1 end bogie is mounted on a wheeel skate. The locomotive was travelling from Barrow to Carlisle for repairs. 25120 was stabled at Perth on May 5th. On July 3rd a relief train to clear David Bowie concert goers saw its electric locomotive borrowed for another service, leaving 25120 & 25032 to work the 23.00 Milton Keynes - Crewe throughout. 25120 worked the 02.35 Euston - Bletchley on August 7th. The last recorded passenger workings for 25120 had a distinct north-west flavour. On September 22nd 25120 worked the 18.05 Euston - Blackpool North forward from Preston. The next day (23rd) a Glasgow Central - Blackpool North excursion was worked forward from Preston by 25120. 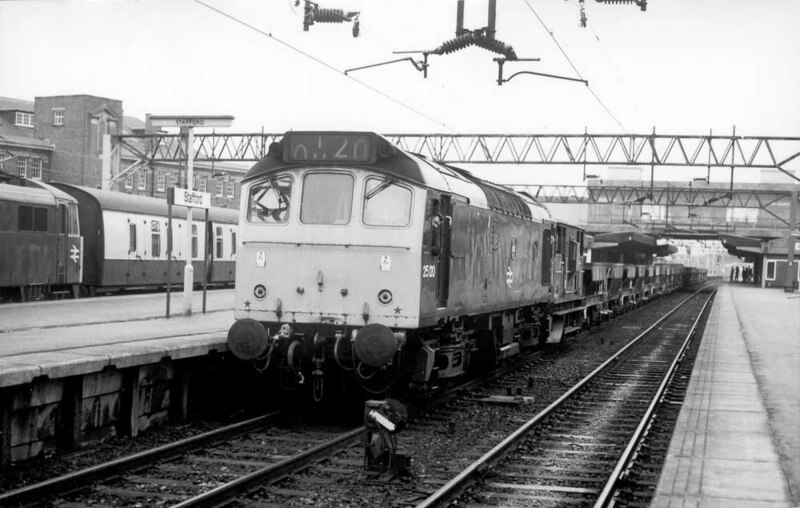 The following day (24th) a similar Aberdeen - Blackpool North excursion was taken forward from Preston by 25120. The last recorded passenger working was on October 21st working the 09.34 Blackpool - Euston to Preston after 47418 failed and returning with the 17.03 ex-Euston from Preston to Blackpool. On October 30th 25120 was noted on an engineering train along Woodvale aerodrome (Merseyside). 25120 was withdrawn on November 27th 1983. Page added December 7th 2012.